I was out for a morning walk with my daughter on September 7th along East Lake Street near the SuperAmerica when I witnessed a common encounter between a car and a cyclist. The driver was driving eastbound on Lake and attempting to make a left turn into SuperAmerica while a cyclist was heading west on Lake. The driver nearly hit the cyclist. Both the driver and cyclist hit their brakes at the last minute to avoid a collision. After that, the cyclist gave the driver a piece of her mind. Obviously, the driver is responsible for maintaining control of their car and should be aware of pedestrians, balls bouncing out into the street, cyclists, and emergency landing airplanes. But, I can see how a driver driving down an empty street directly into the sun might miss a cyclist coming the other way. In the end, it’s better to be alive than right. Which is why I, when commuting east/west along Lake Street, generally do not use Lake Street. Here’s a tip: both 31st Street to the south and 29th Street to the north have even less traffic than Lake Street AND a canopy of trees that improve visibility for drivers. While shifting a block north or south may add as much as two flat blocks to your commute, you may reduce your risk of being hit by someone who can’t see you, and you may find the ride itself more enjoyable. Given a choice, I’d recommend 31st St since it has brand new pavement. Try it. You’ll like it. I had a chance to attend the latest Minnehaha Ave reconstruction public hearing last night to hear more about how the plans are coming together . . . or not. There is a lot of interest in transforming Minnehaha Ave into a more multi-modal street where cyclists and pedestrians would have more than a thin line of paint protecting them from motorists. My daughter’s daycare is on Minnehaha Ave, and I’m a fan of Peace Coffee, so I spend quite a few days per week on the street. One challenge – especially during rush hours – is that the street is used as an artery by people spilling over from Hiawatha. Traffic gets backed up with frustrated drivers who’ll whip around other cars if they give the slightest hint that they plan to turn left or right off Minnehaha. This can make crossing the street challenging at times. And, makes cycling within the painted bike lanes pretty darn scary. The current design tees people up to get hit by frustrated drivers who get so focused on car traffic that they forget that people are using that thoroughfare in other ways as well. A lot of writing has been done regarding the best options for reconstructing the street, such as adding bump-outs at intersections to decreasing the walking distance for pedestrians (this is something I really appreciated on Lake Street when I had a ruptured disc in my back two years ago) and creating physically separated cycling lanes such as cycle tracks. You can find examples at My Broadsheet, Minneapolis Bike Coalition, Joe Urbanist, and Streets.mn. 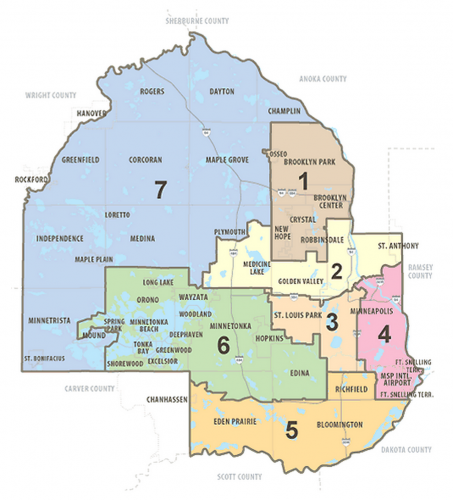 Since Minnehaha Ave is a county road, another thing to consider is whether there are enough votes on the county board to support some of the more progressive design ideas. Commissioner McLaughlin alluded to this when he spoke early in the meeting when he said that nothing gets done in Hennepin County without four votes. It sounds like the commissioners from three most dense population areas of Hennepin County are probably on board with transforming Minnehaha Ave into a route that’s safe for the more diverse transportation choices used by people living in and passing through the Longfellow Community. I seems like Jeff Johnson is probably at the other extreme since he’s running for governor from Bachmann country. Getting someone from such a car-dependent part of the county to comprehend that people in South Minneapolis don’t want or need to hop in their car for every trip to the store, school, or park is about a long a shot as their is. However, it’s tough to use less car-dependent transportation options when roads are optimized for cars (both the driving lanes and parking designs) at the expense of more efficient transportation modes. 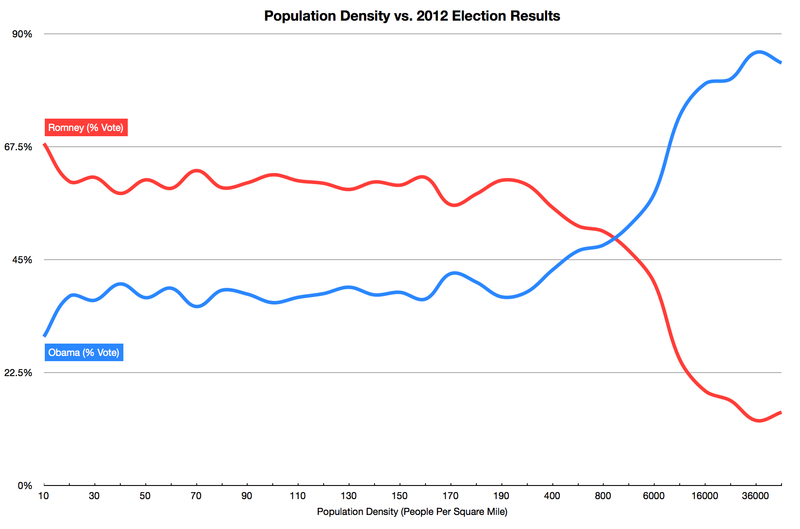 It turns out that populations skew left as they become more dense. So, how does one convince commissioners living in the suburbs that the area along Minnehaha Ave in South Minneapolis has different needs than what their own communities face? It seems like every community in Hennepin County is strongest if each is allowed to play to its strengths. In South Minneapolis along Minnehaha Ave, that would include providing safe routes for people making short commutes to nearby businesses, schools, daycares, and parks without relying upon cars due to the area’s density. Minneapolis 2nd Ward City Council Member, Cam Gordon, recently blogged about the new Minneapolis Bike Plan which outlines what we have today and where things should head in the future. There are some great ideas in this plan. It looks like some solid work went into putting this together, and I hope the plan is taken seriously as roads are reconstructed in the future. 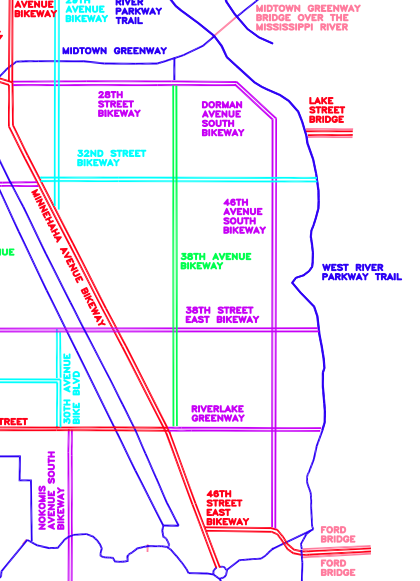 I think the 46th Ave S / Dorman / 28th Street bike path improvement is a great one to have on this list. 46th is a major thru-way for bike commuters who really are trying to get from point-A to point-B rather than meander along West River Parkway, dodging leisure cyclists, runners, and dog walkers. I’ve lived on 46th for 7 years now, so know a little something about the traffic behavior in the area. One challenge the street faces is dealing with cars that treat it as a major thoroughfare. 46th is the first N-S running street west of the Mississippi that runs all the way from the Ford Bridge to Lake Street, and it seems to attract people from places like Highland Park in St. Paul who cross the Ford Bridge then blast their way through residential streets. I get the impression that part of this is due to the design of the street. On the southern part of 46th Ave S, from 46th Street to 38th Street, the street is quite a bit wider and is a bus route. This was also a streetcar route back in the day. But, the streetcar turned west at 41st, then worked its way north again on 42nd Ave S. Unfortunately, car drivers don’t seem to play by the same rules as street cars or bus routes. Car drivers seem to continue at the same pace even after the street gets narrower, making things more dangerous for people getting in/out of cars, and, of course, bikers who suddenly have less room to work with between parked and driven cars. So, should 46th Ave S get a bike-friendly upgrade, one consideration should be to attempt to steer car drivers back onto the wider thru-way streets. That would be better for cyclists continuing on 46th, and for residents living on the narrower streets further up 46th, like me. Two weeks back, I attended a meeting at UROC to discuss the plans to expand the NiceRide bike rental program further into North Minneapolis through the roll-out of additional bike kiosk locations. Here are a few nuggets with commentary. Regarding the expansion into North Minneapolis, this particular move is being driven by special funding that’s specifically earmarked for new stations in North. 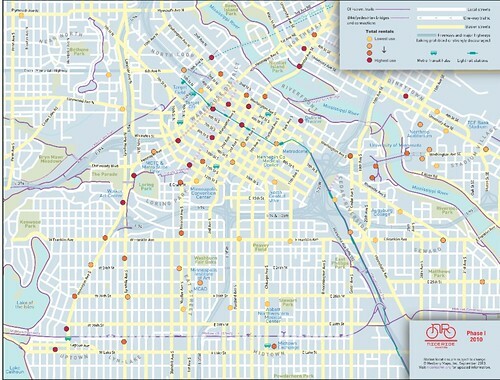 At the start of the NiceRide project in 2010, there were no planned stations for North Minneapolis. Later, they shifted three of the 65 original stations into North (although one is at IMS, which is barely near North). Some money appears to be going toward an outreach project to learn about what will make Nice Ride succeed in North. If Nice Ride would like to pay me to tell them whether (or how) bikes on Lake Street or other spots in Longfellow will do, I’ll take the money. However, I have a hunch that Nice Ride is perfectly capable of figuring that out on their own. Put another way, this seems like an unnecessary hoop for Nice Ride to jump through. There was a discussion about what concerns people have about the program. The biggest one raised regards the deposit that hits credit/debit cards when bikes are rented at the daily rate. When the program first launched, the hold was $200, and took a few days to come off after the bike was returned. Now, they’ve dropped it to $50 after finding the damage/theft rate to be very low. If someone is barely making ends meet, having $50 of credit on hold for a few days could be the difference between bouncing checks (if a debit card is used) or being declined at a store (debit or credit). Since Nice Ride needs to have some accountability beyond the $5 rental rate, I think this is a reasonable expectation, although it’s possible that Nice Ride could make it more clear to renters. However, the best way to get around the credit hold issue is to cough up for the annual pass. That runs $60, and does not cause your card to get hit each time you check out a bike from a station. If you don’t have a credit/debit card, give a friend $60 cash and have them buy you an annual pass. Regarding annual pass sales, it seems like Nice Ride could sell more of them if they made them available at retail locations. For example, I’m sure Birchwood Cafe or Seward Coop would be willing to offer them to their customers. Lowering the friction on getting the annual passes should help increase adoption rates. Another idea that came up was how the maps at stations could be improved. Right now, they show where the other stations are, but they don’t give any insight into how far, realistically, a person may be able to go within 30 minutes before wanting to check in their bike (to avoid overage charges). For example, someone mentioned that the UROC Nice Ride station is a long way from places someone may want to go, such as downtown. However, let’s assume that someone can average a 6MPH for 30 minutes. If so, that gives them a range of 3 miles, which can get someone all the way The Guthrie within 30 minutes. That means that probably 2 dozen current Nice Ride stations are reachable within 30 minutes from UROC, which is the most isolated of all Nice Ride stations at this point. In fact, I think it’s safe to say that anyone could make it from UROC to the station currently furthest from UROC (Birchwood Cafe) with only one exchange (thus, not incurring any charges by having bikes out for longer than 30 minutes). If the maps helped illustrate this, I think people would come up with more ideas on how the bikes could be used for transportation. Another issue that came up include which streets are bike-friendly, or dangerous in North, with Broadway getting the nod as the least bike-friendly street in North. No argument there. Venue-wise, it seems likely that the new stations going into North will likely fill in some of the holes in the currently network along Plymouth, bring Broadway into the mix, and possibly get some action along the Mississippi River. Overall, it’s great to see the system growing, since it adds value to everyone by expanding the network. Nice Ride crushed it with their 3-month update blog post. They broke down how things are working at levels well beyond what I’m used to seeing from non-profits. This level of transparency should be applauded. I love this kind of data. Here are a few takes on what I see, based on being a Nice Ride subscriber, someone who’s been to all 65 kiosks, and a bit of an analytical geek. 1. The U of MN’s numbers seem low, but the timeframe is before school started. A college student who has to cross between the East and West Banks should be able to justify an annual subscription just for the time savings crossing the Mississippi river. 2. Kiosk density seems to help. Kiosks at the outer edges of the current network – especially in North, where the density is lacking currently – are the ones with the lowest usage. If you can go N-S-E-W from a kiosk, it’s going to do better. I mentioned this in the comments of a post on Johnny Northside where they were discussing locations for the 5 new kiosks that are planned for North. While it would be cool to expand the geography well beyond what Nice Ride covers today, I think the system will have the most chance of success if it grows in, say, 6 city block increments in any direction it chooses to expand in. Beyond that, it loses out on the power of the network. 3. Population density is another key to success. Just like transit, having enough people within walking distance of a stop is key to making the numbers work. Uptown, downtown and the U of MN have that going for them. As things expand beyond core high density neighborhoods, use will likely be lower because less people live within walking distance of kiosks. This may be an issue for the new stations being added in North Minneapoils since there are so many foreclosures up there, the density of population may not be all that high. 4. One thing that may improve the maps at the kiosks is to help people understand where they could realistically get to within 30 minutes via the Nice Ride bikes. The range is larger than most people probably realize. For example, I’ve picked up bikes at my closest kiosk, Birchwood Cafe, and cruised to downtown, Dinkytown, and St. Anthony Main with no additional trip charges. 5. Ladies, step it up. Only 38% of the trips have been done by women? You can do better. 6. The system is far from profitable at this point. For example, a grant from the city is helping expand the network into North Minneapolis by 5 kiosks for $228,500. That figure closely mirrors ($244,247) what the organization has earned in user fees to date. They have grants, sponsorships, and advertising that help bridge the gap. That’s what comes to mind. Check out the reports. They have a ton of excellent information that helps explain how things are going. Graham Lampa shot a quick video this morning showing how to check out a NiceRice bike. It took him just over 2 minutes to pay and check out a bike while holding his iPhone. 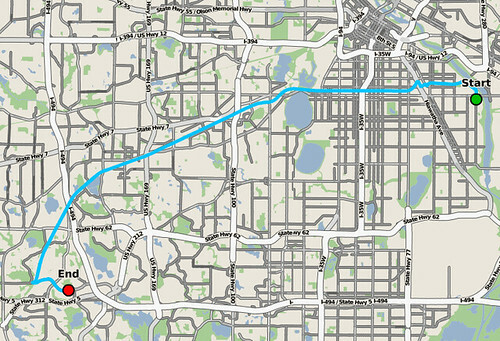 As Graham mentions in the video, he was planning to ride from near Lund’s in Northeast to Al’s Breakfast in Dinkytown. That’s a couple miles. When he gets to Dinkytown, he can check in the bike on 4th near Burrito Loco and walk the last block to Al’s. Since he’ll have the bike back in a kiosk in under 30 minutes, he won’t have any additional trip charges. In fact, he could bounce around town all day like that for his $5 (plus tax). If you make longer trips between stops, you may rack up some additional charges. That’s explained here. 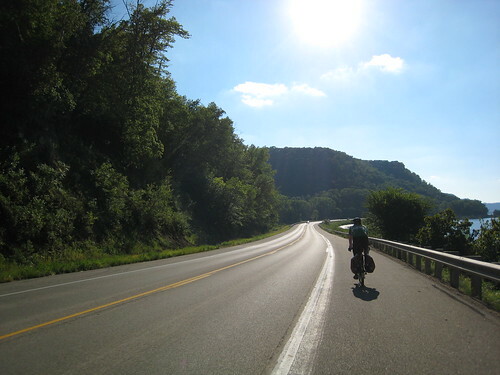 I took on the Niceride 65 Challenge last Sunday. 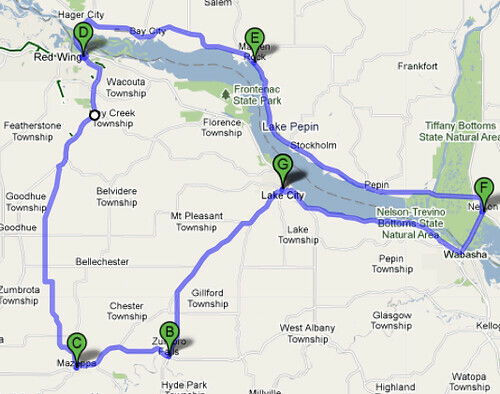 The challenge is to visit all 65 Nice Ride locations within 24 hours. Done. However, I had a glitch. When I got home I checked my results on the Nice Ride website where subscribers can see a log of all their trips. Unfortunately, I missed one downtown, so I swung back to downtown later in the day to pick that up. Total time: 8 hours, 8 minutes. That’s a pretty soft time, considering that I hit the first 64 kiosks in 2:35. Sub-2:30 is very doable. Heck, I could do it. I’ve had a chance to do some cool bike trips around town lately. 1. Reuben & Melanie organized Tour de Taco, which started at Powderhorn Park and involved stops at Liberty Frozen Custard (Chocolate), Sebastian Joe’s in Linden Hills (Raspberry Chocolate Chip), and Pinedas Tacos. In the end, I went for a burrito rather than tacos. I had a chance to meet some awesome bloggers (and some non-bloggers too). 2. Carly and I walked to the Birchwood Cafe and checked out some NiceRide bikes for $5 for the day. We took a leisurely route back and forth across the Mississippi at Franklin, through the U of MN, back across the Washington Ave bridge, then across the Stone Arch Bridge to St. Anthony Main where we checked the bikes back in near Pracna. We hit Pizza Nea for dinner (we got the special as Aaron recommends on Foursquare. Then we biked on 5th Ave SE to the 10th Ave bridge and took Riverside to the Seward Coop where we stopped for some chocolate and root beer (once again checking the bikes back in so we didn’t have to worry about them). 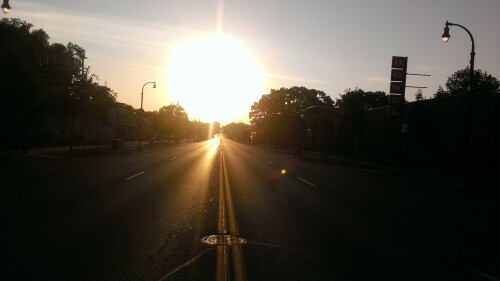 From there, we took Minneapolis Ave back to the Birchwood. A perfect use of the NiceRide bikes for a combination of walking and biking around town. 3. Kyle and I did a disc golf bike tour with a quick first stop Wabun Picnic Area, followed by a beer at Sea Salt. Then we busted a move to North Valley Park in Inver Grove Heights to get in another round. A stop at Highland or even Kaposia could have saved us some miles, but I decided that Kyle needed to experience North Valley, and he played along on his single speed while rolling through the hills on 70th St.
4. Aaron and I biked to Meers Park for the Communist Daughter concert (part of the Music in Meers series). Getting there is pretty easy with a straight shot down Marshall from our houses. On the way back, we took Selby, which has little to no traffic and night. We stopped at the Muddy Pig and ran into Greg & Carly Sax, then scooped up some late night snipe signs in St. Paul. Good times. 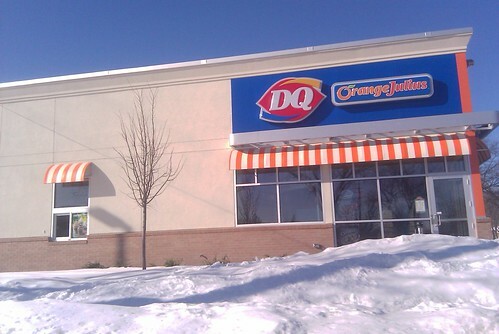 What what I’ve heard, the window on the side of the new Dairy Queen near Minnehaha Park is going to be used as a bike drive thru. 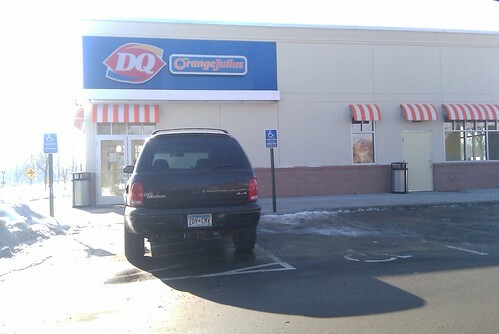 As far as I know, this is the first of its kind in Minneapolis. I can imagine this filling up with families in their 6-person bike rentals from the park. While in the ‘hood, I found an interesting display of handicap parking failure where this SUV managed to screw things up for not one by two handicap spots by parking in the buffer zone between the spots. It turns out that there is a reason for those stripes of paint on the pavement. Robin Garwood points out on the Second Ward, Minneapolis blog that Cyclopath is one awesome bike route mapping tool for the Twin Cities. One common barrier to bike commuting is finding a safe and effective route. This site should give people some great ideas whether they’re looking for a better route to work or the best way to get to a friend’s house. It’s also editable, so add additional bike friend roads and trails that you know about.